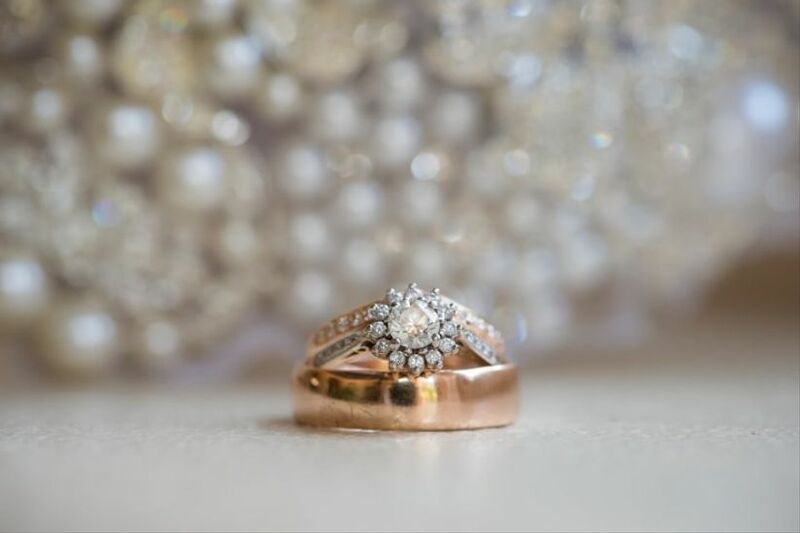 Your Essential Guide to Engagement Rings | Wedding Tips ARE YOU A SUPPLIER? You want your partner to be head over heels for their engagement ring! Here’s everything you need to know about bling, rings and shiny things. Congratulations! You’re about to take a huge step in your relationship, but before you propose you’re going to need to do a bit of shopping. For what, you ask? An engagement ring, of course. From when you should start looking to what type of rock you should be shopping for, we’ve answered all the important questions to help you on your journey to find “the one”. This is your essential guide to engagement rings. When should I start looking for an engagement ring? You shouldn’t start hunting for an engagement ring until you’re 100% ready to propose. After all, a ring is a big investment and a marriage proposal is a huge step. 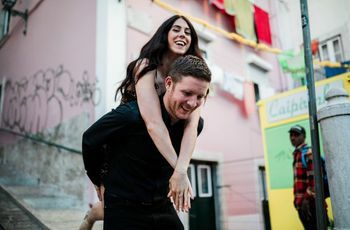 Keep in mind that some people get engaged within weeks of meeting their partner (love at first sight is a real thing!) while others wait years (sometimes even decades) to pop the question. There is no “right” time, just move at your own pace - when you know, you know. 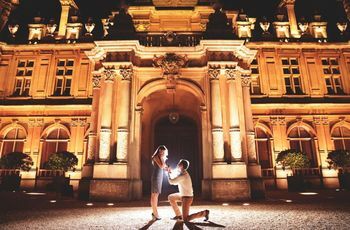 Once again, this varies from person to person.. On average, people spend about £1,080 on an engagement ring, but it’s not unusual to dip below the £500 mark. The aim of the game is to find something beautiful that won’t break the bank. How do I decide on a style of engagement ring? There are a lot of factors to consider when choosing an engagement ring. The band, the stone and the setting are all important, and you’ll want to put thought into each and every part. If your S.O. hasn’t dropped any hints about what they love, you’ll have to do a bit of homework. Pay attention to their style, the jewellery they wear on a daily basis and the types of things they like on Instagram and Pinterest - these are great clues. Remember, if you’re really stuck, you can always ask a friend or family member to help you out. Should I ask my partner to help choose their ring? 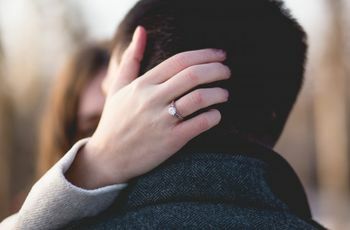 If you and your partner have already discussed the engagement in depth, it’s not unusual to ask them to help choose their ring. However, if you don’t want to ruin the surprise, there are a few ways around bringing them to your jewellers. Option one: bring their best mate or a family member. Ask your partner in crime to do a little digging beforehand to find out what your S.O. likes and what they absolutely hate in a ring. Option two: purchase an inexpensive placeholder ring and then bring them to a jeweller post-proposal to select or design their own. Where should I look for an engagement ring? After you’ve figured out what you’re looking for, it’s time to hit the shops. Start by popping into local retailers and looking at their selections. This will give you a good jumping off point. If you’re not familiar with any shops, or would prefer to do the research from the comfort of your own home, try browsing our vendor directory (it’s filled with amazing UK ring designers and jewellers). 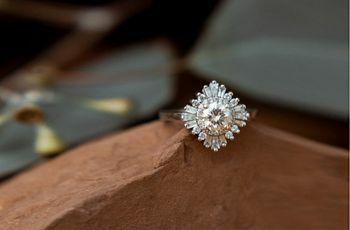 Keep in mind that you don’t have to buy a generic ring, if you’re extremely particular or want to make the piece extra sentimental, consider working with a jeweller to custom design one from scratch. Where should the diamond come from? Before you say yes to your ring, ask your jeweller where the diamond (if you’ve chosen a diamond) comes from. Africa, Europe and Canada have a ton of diamond mining operations, but not all of them are ethical. Whichever source you choose, you’ll want to ensure that it has high environmental standards and cruelty-free practices. Luckily, plenty of UK shops (including Ingle & Rhode and MADE Diamonds) focus on environmentally-friendly and ethically responsible gems, so you won’t have trouble tracking down something beautiful. Where should I store my engagement ring? You don’t want your partner finding the ring before you’re ready to propose, so tuck it away in a ring box and hide it in a place they’ll never look. Somewhere higher than they can reach, your sock drawer or a locked file cabinet make for excellent options. If you’re really worried about them finding it in your flat, ask your jeweller to hold onto it until the big day arrives.